Cambodia’s first ever International Rules Football Game, comprising of Gaelic and Aussie Rules football, will take place in Phnom Penh tomorrow. Teams will battle it out in men’s and ladies’ football matches at Northbridge International School. Cairde Khmer, the country’s first GAA club, was setup in October 2017, with members spread across Cambodia’s two largest cities, Phnom Penh and Siem Reap. In November 2017 and 2018, the club sent teams to Bangkok to play in the Asian Gaelic Games. These teams included both a men’s and ladies’ Gaelic football team, as well as a hurling team. In particular, the men’s football team did very well, losing the Junior football semi-final in 2017 and the final against South Africa in 2018. This was the sole defeat for the men’s team over the whole weekend both years. “Both clubs are excited to play each other this coming St Patrick’s Weekend. Not only is it a fantastic opportunity to connect with the wider Khmer and Expat Community, but also to promote Irish Culture in South-East Asia,’ said Cairdre Khmer’s founder, Conor Wall. The Irish will take on the city’s AFL team, Cambodian Eagles Football Club tomorrow. The Club was established in 2008 and encompasses three teams: the Eagles (expatriate and Khmer men’s team), the Cobras (the national men’s team), and the Apsaras (expatriate and Khmer women’s team). In 2018 the Cambodian Eagles hosted and toured for international matches against Thailand, Vietnam, Malaysia, and Singapore, while the national men’s team, the Cobras, were victorious in the inaugural Vietnam AFLX tournament at RMIT University in Ho Chi Minh City. Last November, the club decided to reward some of its local Khmer players for all their hard work in training. 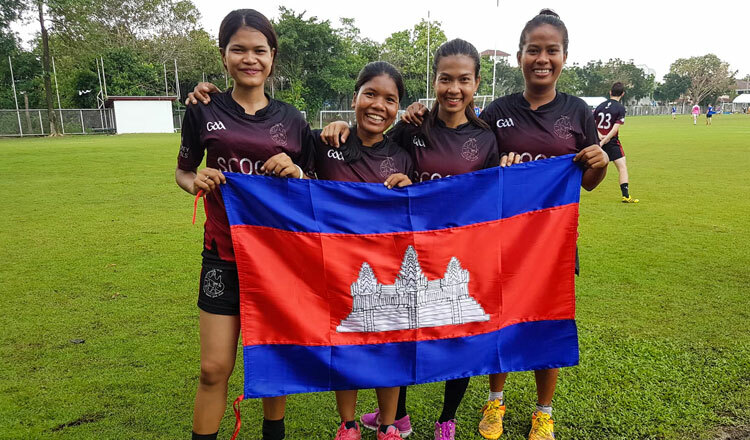 As such, an all-expenses-paid trip was given to four female players to help the Cairde Khmer ladies junior football team in Bangkok. For three of the four selected players, the weekend not only represented their first trip abroad, but it also provided them with their first ever airplane journey. All four players behaved admirably over the weekend, playing with both courage and humility, and the whole Cairde Khmer family is immensely proud to call them our sisters. The Club also made some headway in its efforts to promote AFL amongst the kids, with growing numbers of young players joining the Auskick clinics organised on Saturday mornings at ISPP.